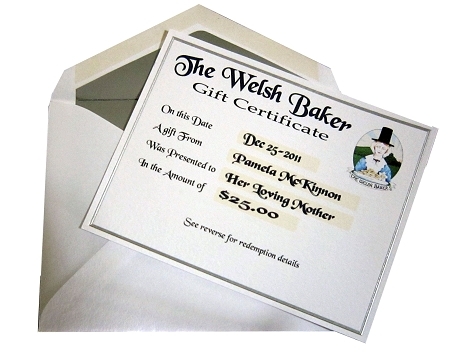 The Welsh Baker Gift Certificate may be used like cash on our website to purchase anything we sell. It may be used in conjunction with coupons and promotions. They are sort of a neat way to send a gift of Welsh Cakes when you don't know about things like taste preferences or food allergies. It can take 2-3 days to process and mail the paper certificates so allow 5 days to for them arrive. Certificates have no expiration date. Sorry - promotional discounts may not be applied when purchasing gift certificates however the redeemers may apply promotional discounts when they redeem the certificates.